America Ferrera is an award-winning actress, producer, director and activist. Ferrera is best known for her breakthrough role as Betty Suarez on ABC’s hit comedy, Ugly Betty, for which she won Golden Globe, Emmy, Screen Actors Guild, ALMA, and Imagen Awards. She produces and stars in the acclaimed NBC workplace comedy, Superstore, currently in its fourth season. In 2016 Ferrera cofounded HARNESS, an organization connecting storytellers and activists to amplify the cultural narrative around social justice. She speaks throughout the country as an advocate for human and civil rights and was the opening speaker at the monumental Women’s March on Washington in January 2017. Ferrera resides in New York and Los Angeles with her husband Ryan, their son Sebastian, and their two golden retrievers. "Readers will come for the big names, but they'll stay for the powerful stories, excellent writing, and feeling of connection. An absolute must for well-rounded collections." "You know some of the writers already (hello, Lin-Manuel Miranda and Issa Rae), but their voices give powerful insight into the lived experiences of so many." "Wide-ranging and heartfelt, this timely collection is quintessentially American." "Filled with gems. … From some of the biggest stars in art and entertainment come funny, touching and complicated reminders that the word ‘American’ is wonderfully and endlessly undefinable." "In a timely and compelling discussion, Olympic athletes, politicians, writers and actors reflect on their varying heritage and American identity." 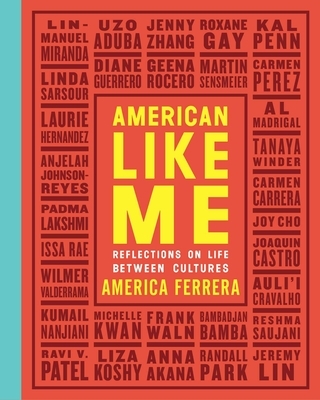 "Even though this anthology speaks to the American experience, the themes of belonging and identity will hit home for anyone who’s ever felt torn between two cultures or two places equally dear to them."